Baby Care Expert Rachel Waddilove has created some thoughtful advice when tucking your new baby in. 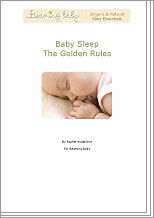 Rachel provides advice for your baby's bedtime and sleep routine. Make sure your baby has a full tummy, does not have wind and has a clean nappy. A simple, practical guide for you and your baby when it's time for bed.